Shoreham have announced new investors have come into the club. Business partners and ex-players TC Johnston and Garreth Newton will work with joint chairmen Ralph Prodger and Stuart Slaney in running Mussels. 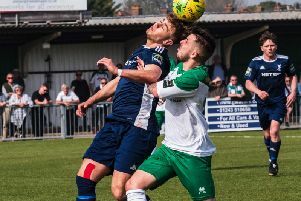 Shoreham reached Bostik League level for the first time in their history in 2017 but were relegated after just a one season stay. Mussels have won four of their opening 13 SCFL Premier Division matches this campaign and sit 13th in the table but the club are looking to kick on again. Keen football fans Johnston and Newton are pleased to be involved in a club at board level and said: "We have been looking for the right club to partner with and take everything as far as possible. "Being both ex-players, football is a huge part of our lives and we are excited to utilise our assets and skills to make this club the biggest and best it can be. "Shoreham Football Club and community have an incredibly bright future to look forward to. "We cannot wait to embark on this journey of greatness. We also look forward to the near future to try to improve the youth set-up so they can maximise their potential. We’re fully looking forward to improving this club, but for us to do that we also need the support from the community to support us in what we’re trying to achieve." Joint chairmen Prodger and Slaney have grown the club from a youth aspect in recent seasons and want continued success at younger and senior levels. Speaking to the Shoreham club website, the pair were quoted: "When we took over at Shoreham FC the club only had five teams and with the hard work of everyone at the club, we now have over 23 teams with an academy of over 100 children. The club has quadrupled in size within three years which has meant it’s been difficult and increasingly hard work to run. "Now with TC and Gaz joining us and bringing their talent and experience, we are hoping this will allow the club to grow even bigger and for all at the club to focus on areas that need developing. "This is an exciting time to be part of Shoreham FC and there will be good things happening for the club and the community."